Greet the day with a warm biscuit sandwich. 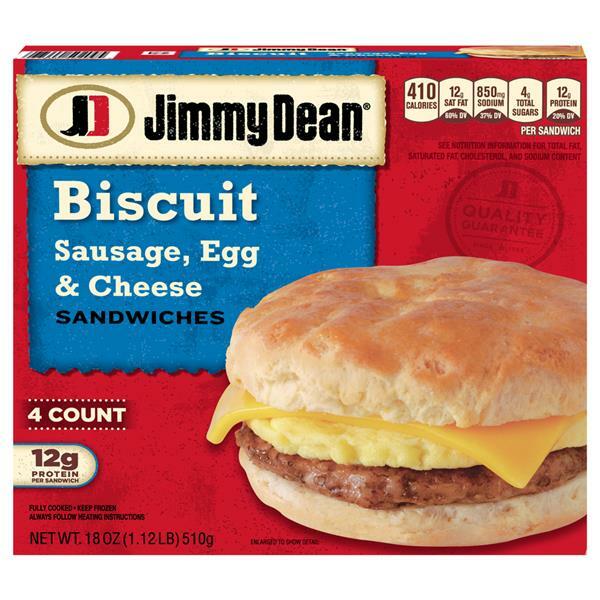 Featuring seasoned pork sausage, fluffy eggs, and melty cheese on a golden baked biscuit made from scratch, Jimmy Dean Sausage, Egg & Cheese Biscuit Sandwiches make waking up in the morning the most delicious part of the day. Packed with 12 grams of protein per serving, this breakfast sandwich gives you more fuel to power your morning. Simply microwave and serve for a delicious breakfast at home or on-the-go. Includes 4 individually wrapped sandwiches. Breakfast is a great deal like life. You get out of it what you put in. Jimmy Dean himself once said “wake up like a tight pair of pants ready to rip” and that good morning feeling can only be done with a good breakfast. 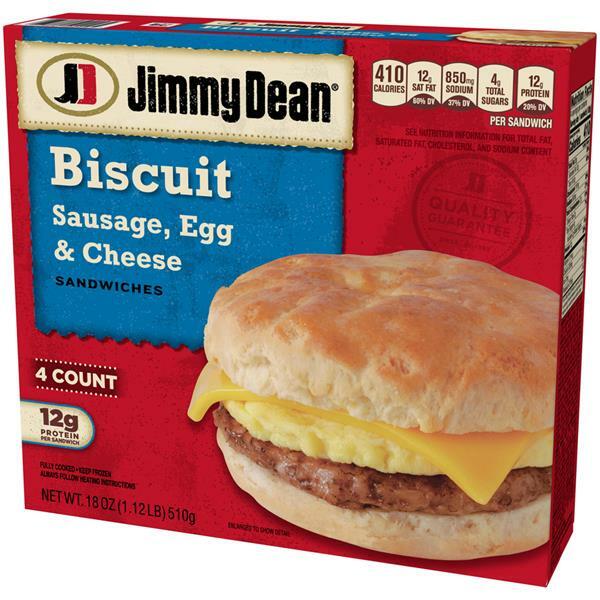 To us today at Jimmy Dean Brand, the sun is always shining in the morning, and that always starts with focusing on quality and making the world a better place, one breakfast at a time. Biscuit: Enriched Bleached Flour (Wheat Flour, Malted Barley Flour, Niacin, Reduced Iron, Thiamin Mononitrate, Riboflavin, Folic Acid), Water, Palm Oil, Buttermilk. 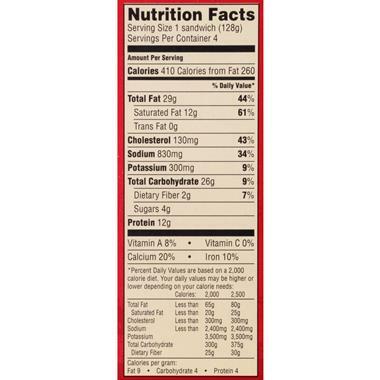 Contains 2% Or Less Of Each Of The Following: Isolated Soy Product, Sugar, Baking Soda, Dextrose, Salt, Acidic Sodium Aluminum Phosphate, Monocalcium Phosphate, Lactic Acid, Datem, Potassium Sorbate (Preservative), Maltodextrin, Natural And Artificial Flavors, Colored With (Annatto And Turmeric), Xanthan Gum, Soy Lecithin, Soy Flour, Fully Cooked Pork And Chicken Sausage Patty: Pork, Mechanically Separated Chicken, Water, Soy Protein Concentrate, Contains 2% Or Less: Salt, Pork Stock, Spices, Dextrose, Sodium Phosphate, Sugar, Monosodium Glutamate, Citric Acid, Flavor, Caramel Color. Grilled Egg Patty: Whole Eggs, Nonfat Milk, Soybean Oil, Modified Corn Starch, Salt, Xanthan Gum, Natural And Artificial Butter Flavor (Soybean Oil, Butter, Lipolyzed Butter Oil, And Natural And Artificial Flavors), Citric Acid, Soy Lecithin (Release Agent). Pasteurized Processed American Cheese: Milk, Water, Cheese Culture, Cream, Salt, Sodium Citrate, Potassium Citrate, Sodium Pyrophosphate, Sorbic Acid (Preservative), Sodium Phosphate, Citric Acid, Annatto (Color Added), Soy Lecithin, Enzymes.